Spam is well known for providing a convenient source of meat in a can, yet it is rarely considered a healthy food choice. Spam offers a variety of meats, some of which have a better nutrition profile than others. By examining the specific nutritional information of Spam's lineup of products, you can choose the Spam product that comes closest to meeting your individual nutritional needs. According to the USDA National Nutrient Database, Spam’s classic luncheon meat provides 174 calories per 2-ounce portion. Each serving provides 15 grams of fat, 2 grams of carbohydrate and 7 grams of protein. The caloric distribution is 79 percent of calories from fat, 17 percent from protein and 4 percent from carbohydrates. 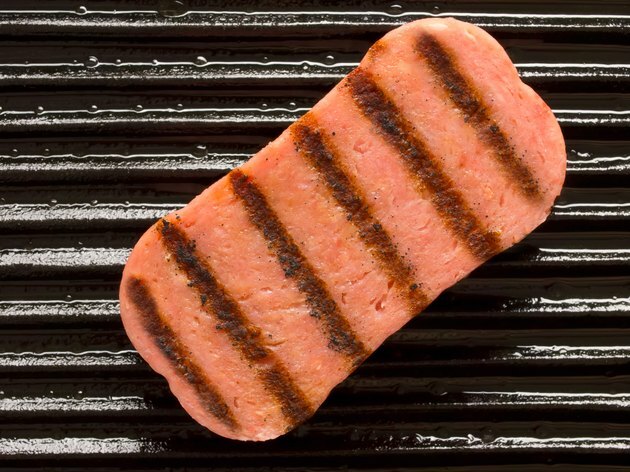 Spam is made of two different cuts of pork, according to the product website. This makes Spam a very high-fat food. Additionally, each serving contains 6 grams of saturated fat, which is 28 percent of the daily value. In comparison, a 3-ounce fried beef burger contains roughly 4.5 grams of saturated fat. Diets high in saturated fat may increase risk of heart disease, according to MedlinePlus.com. For those who wish to eat Spam without consuming a large quantity of fat, Spam offers a lite version of the luncheon meat. Spam’s website claims the lite version contains 33 percent fewer calories, 50 percent less fat and 25 percent less sodium. Each serving contains only 8 grams of total fat, 3 grams of saturated fat, 1 gram of carbohydrate and 9 grams of protein. If you would prefer to retain the high-fat content of the classic variety but still reduce sodium by 25 percent, then the less sodium version of Spam is the best option. This version of Spam is just like the classic but with only 580 milligrams of sodium, compared to 790 milligrams per serving. While reducing sodium intake is beneficial to heart health, it is difficult to ignore the high-fat content that remains in this product. Another alternative to reduce fat content is Spam’s oven roasted turkey. This product is made from all white meat turkey, which makes it much lower in fat than the classic version of Spam. Each serving contains only 80 calories, 4 grams of fat, 1 gram of saturated fat, 2 grams of carbohydrate and 8 grams of protein. The oven roasted turkey contains even less sodium than Spam’s lite or less sodium versions, totaling only 450 milligrams per serving. This is likely the healthiest option in Spam’s line of luncheon meats. Spam does not stop at providing only luncheon meats, but also makes hot dogs. The hot dogs contain 170 calories, 15 grams of total fat, 6 grams of saturated fat, 1 gram of carbohydrate and 7 grams of protein per serving. This makes the hot dog identical to the classic version of Spam in terms of fat and saturated fat content. The hot dogs are actually the lowest sodium option, even lower than the oven roasted turkey, providing only 420 milligrams per serving. Spam.com: What is SPAM® Classic?